I thought I would share a tool that has proven to be helpful to a new blogger. 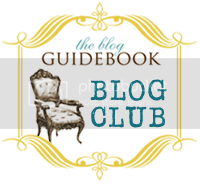 The Blog Guidebook is a site that offers many tips on blogging for newbies. I have referenced this blog on many occasions. It shares tutorials on getting started and most recently it provided a step-by-step on finding, downloading and linking the social networking icons that I cannot get to work! In an effort to grow my blog and to meet and learn from fellow bloggers, I joined their Blog Club. It’s a small group of bloggers that support one another. There are so many tools out there, it can be overwhelming! Be sure to check out The Blog Guidebook to find a comprehensive list of helpful tips and tutorials! Btw, I wanted to tell you that my parents were at the Design House in Columbus over the weekend! (They live in Dublin, OH.) They loved it. Next time I'm out to visit them, I'm going to make them take me to find your booth!